A few weeks ago I signed up to participate in the Mouthy Stitches swap and I am SUPER excited about my partner. She makes really beautiful things, but her taste in colors is pretty different from mine so I have been looking forward to stepping outside my box a little bit. 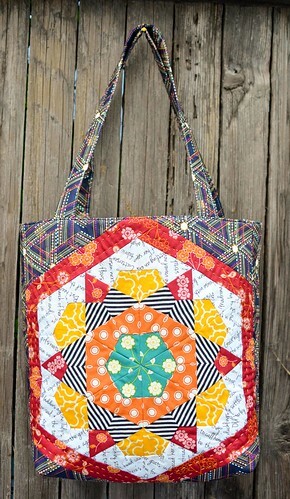 I have been wanting to try the Jazz Hands block from Material Obsession 2. Thank goodness for Faith over at Fresh Lemons Quilts for her great tutorial on sewing this block or it may have never happened. Since everyone in the swap is supposed to make this tote, which isn't very big, I had to shrink my Jazz Hands block down a little. It's finished size was about 11.5" from point to point. 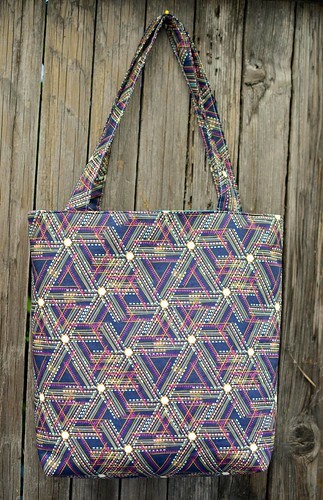 The red, green, and navy fabrics are all from the Indie collection from Art Gallery fabrics. I bought them thinking that my partner would like them, but I really fell in love with them. The navy was originally supposed to be the lining but I just loved it so much I decided to use it for the outside. The lining is the green Indie print. I used Thermolam for the exterior of the bag and a lightweight interfacing for the lining and it stands on its own without being too stiff. I had originally intended to do some machine quilting on the block, but I just couldn't bear the thought of sewing over it, so I did some hand stitching around the border. The Y seams in the block weren't as difficult as I thought they would be, but there are A LOT of them (this block is composed of 72 pieces, so that's 24 Y seams). So if you are wanting some practice, this is a good block to try! I am really looking forward to seeing what everyone else makes! This is fabulous - you have a very lucky partner! Fabulous indeed. I'm making a whole quilt with those blocks and it is taking FOREVER! Wow, your tote is great. Your partner will love it, whoever she is! This is amazing!! I love your fabric choice!